In previous "Mission: Impossible" movies, action often came first, and story second. It's almost ironic then that when writer-director Christopher McQuarrie and Tom Cruise decided to focus on character for the sixth movie, "Fallout," now playing nationwide, they'd end up with the most exciting "Mission" ever — wall-to-wall with stunning set pieces in helicopters, trucks, motorcycles. Even a three-man fight in a public restroom is a standout sequence that rivals the very real danger Cruise put himself in (106 times) to do a parachute jump from 25,000 feet. 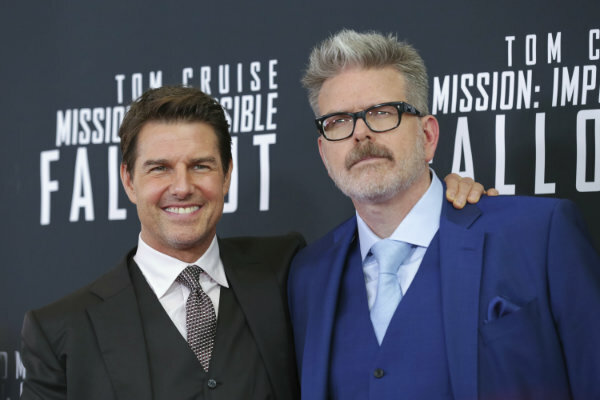 McQuarrie, 50, a Hollywood journeyman who won an Oscar 22 years ago for writing "The Usual Suspects," has been one of Cruise's go-to guys for a decade, writing "Valkyrie" and "Edge of Tomorrow" and directing "Jack Reacher" and 2015's "Mission: Impossible — Rogue Nation." He spoke recently from Seoul about his crazy feat, and making the sixth, and best-reviewed, "Mission" movie. McQUARRIE: We did not set out to make you know the biggest, giant-est, craziest, most outrageous "Mission" ever. I said to Tom I want to make a more emotional movie, a more character-driven movie that's more about Ethan. By keeping our heads down and focusing on that it didn't really occur to us just how big ("Fallout") was until we were well into it. As we started to take stock as the movie started to take shape we realized, "Oh my God we've got this sequence, that sequence, this other sequence." In a previous "Mission: Impossible" any one of those stunts would have been The Stunt. Q: That's surprising that it's not all mapped out meticulously. McQUARRIE: Tom said with "Rogue Nation," ''I want the audience to experience what it's like for us to make movies." There's very little difference between watching a "Mission: Impossible" movie and making a "Mission: Impossible" movie. A lot of these things we're making up as we go along. There's very seldom a finished script when we go into production. We come up with big crazy ideas in the middle of the movie, so people are forced to scramble to put them together and it's always a race against the clock. The vibe of what you're feeling when you're watching the movie is what we feel every day when we go to work. Q: And yet your action sequences are notably coherent — no shaky cam, no contrivances. Why do you do it that way? McQUARRIE: I'm obsessed with clarity and geography. Those are the first two rules of any action sequence ... For me it's important that you sit back and the movie comes at you and requires nothing from you in terms of comprehension. What that demands of the actors is that they bring the energy. And when you look at that bathroom fight, it's very straightforward: Three guys fighting in a bathroom. But the actors were all so focused and so rehearsed and so dedicated to what they were doing, the energy is on screen, not in the camera work. And I don't get inside the fight. I stay outside of it. Just over one character's shoulder. What I'm doing is essentially making you a bystander. I'm putting you right in the action. Q: Is there a set-piece you're most proud of? McQUARRIE: The things I'm most proud of are the emotional moments. Ilsa (Rebecca Ferguson) following Ethan is the definition of what we call shoe leather. And it cannot survive the "get to the next moment right now" process of filmmaking. That survived four test screenings. Never got a studio note. The fact that I cut two giant stunts out that were in the first trailer, and yet that scene stayed? That's something I'm immensely proud of. Q: What was going through your mind when Tom Cruise got injured during filming? McQUARRIE: Disaster is the opportunity to excel. When you make enough movies, you realize that setbacks are a natural part of the creative process and if you don't panic, they almost always turn to your benefit. So as soon as he broke his ankle, my first concern was, "Is he OK" not, "Oh no this is going to ruin the movie." I knew this was going to in some way benefit the film. And it did. We shut production down. Tom went right into physical therapy. And I went into the editing room and started to assemble the movie. I was able to make the discoveries I normally wouldn't have made until well after the film was finished. Q: What are your aspirations from here? McQUARRIE: I started directing as a means of making the one movie I really dreamed of making and never got there. Where my career changed was when I stopped asking, "Would you make my movie" and started asking, "How can I help you make your film?" And the change was immediate. I went from not making a film for seven years to working on 13 or 14 movies in the last 10 years. I just go through the door that opens. I'm following whatever happens and currently I've got Tom Cruise saying, "All right, what are we doing next?" That's a very difficult thing to walk away from.